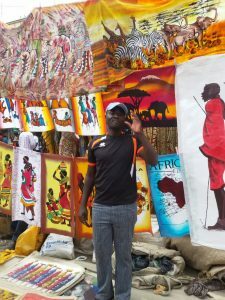 African Artisan at his stall in Kenya, Africa. Purchases African art for resale to support African Artisans and generate revenue for Expanding Opportunities. Expanding Opportunities supports African artists by purchasing their one-of-a-kind, handcrafted art pieces for resale through Aina Moja shop. Artists whose products are sold through Aina Moja receive fair market value for their goods. The profit that is earned from Aina Moja sales goes to Expanding Opportunities. The money is then used in the different programs of Expanding Opportunities. Aina Moja has a physical shop at 39 Main Street in Belfast, ME. Shop hours are Monday, Wednesday, Friday and Saturday, 11:00 – 5:00 (EST). You can visit the online store at http://www.ainamoja.com. Other African items are sold through 1st African Clothing and Kanga USA. All proceeds support the projects of Expanding Opportunities.